Jenna Blum’s second novel, The Stormchasers, focuses on estranged twins Karena and Charles. After two decades, Karena follows a stormchasing group as a reporter in an effort to find her bipolar brother. Blum mixes a dark past, the bonds between twins [even those who’ve lived apart for many years], unpredictable often scary weather patterns and nearly almost more frightening vast territory- chasing tornadoes and violent storms– in the middle of America with a bold woman, Karena, and her dedication to find and possibly reconcile with her brother after so many years. In my interview with Jenna, she discusses many of the topics addressed in The Stormchasers, her meticulous research, various aspects of writing, elements of the craft and her own propensity to seek out bizarre weather patterns. Recently, Oprah listed Jenna one of her top 30 favorite writers. Jenna lives in Boston. Amy Steele [AS]: What appealed to you about writing a story about twins? 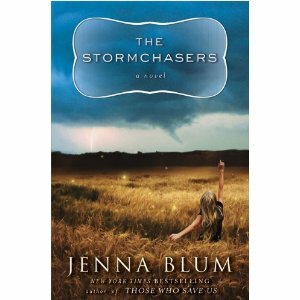 Jenna Blum [JB]: For THE STORMCHASERS, which is at its heart a novel about bipolar disorder and its consequences, I wanted to explore the relationship between siblings, one who has the disorder and one who doesn’t. Family members of people with bipolar disorder often feel guilty that they don’t have it themselves, and Karena’s guilt is exponential because her brother Charles, who’s bipolar, is also her twin. I’m not a twin—though I had an imaginary twin when I was a girl—but I had an amazing time researching the bond, reading and asking twins questions. I was interested too in how devastating it would be to be a “twinless twin,” or in the case of my characters estranged twins. How completely twinship informs twins’ lives! and often not in the ways we non-twins would expect. JB: I’ve always been fascinated with storms. When I was a little girl, we used to visit my grandmother in southern Minnesota in the summers, and often, in the middle of the night, the tornado siren would go off and we’d have to run to the cellar. To me, a girl obsessed with The Wizard of Oz, this was terribly exciting. When I was four, I had the experience my heroine Karena has in THE STORMCHASERS: of seeing a tornado while everyone else was asleep. Like Karena, I hid beneath the living room couch and watched the black rope twister move across the picture window. I then spent much of my life trying to see another. My obsession with severe weather led me to stormchase as an adult, first as an amateur in Minnesota with my poor mom in tow, later with the professional stormchase group Tempest Tours (for description of what this was like, see Chase Diaries on my website). Like my characters, I’m still trying to understand the mysterious, majestic machinery behind big weather: how something as powerful and destructive as a tornado can happen so quickly, seemingly from a clear blue sky. And as a writer I’ve always been interested in how people put their lives back together after they’ve been devastated by huge forces beyond their control. AS: What was the research like for this book—5 years with Tempest Tours—is that a long time to research? JB: Not for me. Keep in mind that for my first novel, THOSE WHO SAVE US, I spent ten years researching the Holocaust, including interviewing survivors for Stephen Spielberg’s Survivors of the Shoah Foundation. So you’re talking to a girl who believes in getting the details right. But both THOSE WHO SAVE US and STORMCHASERS deal with complex subjects—the Holocaust, the mechanics of severe weather—and for ‘CHASERS, I was basically taking a crash course in meteorology. This was tough for somebody with no math brain whatsoever. Plus, the storms are so awe-inspiring that my first couple of trips out with Tempest—which is the best storm tour company in the business, by the way—I was basically just standing there with my mouth open. It has taken five years to be able to a) understand even some of what’s going on in the atmosphere and b) get used to it enough to be able to ignore it for a few minutes so I can gather the attendant details that make a scene come alive for a reader. AS: Can you describe what happened? JB: I got to see the greatest show on earth: the phenomenal sky sculptures known as supercells (rotating thunderstorms that sometimes produce tornadoes). I got to see some tornadoes! I got to see the stark, lonesome, majestic parts of this country you can get to only by driving, not to mention the World’s Largest Ball of Twine, the Mitchell, South Dakota Corn Palace, and Wall Drug. I got to eat a lot of road food. I now know how to make a healthy meal at a convenience store (string cheese, pretzels, V-8) and how to make a root beer float from A&W and an ice cream sandwich—while driving 75 mph. AS: What was the best part of the research experience? JB: I love everything about chasing: the beauty of the storms; the beauty of the landscape; the way chasing catapults you out of your everyday life and concerns and, because you’re playing a potentially deadly game of chess with severe weather, forces you to concentrate on the moment. What surprised me about chasing was the friends I made. I didn’t expect what I now think of as the “Band of Brothers” effect, but what happened was, I met total strangers who shared my passion for severe weather, and then we spent several days and nights on the road together, talking during down times, sharing the terrifying adrenaline-filled moments. Now half my closest friends are stormchasers who live on the Plains. And they will all be at my book launch! AS: Karena is a journalist. Why did you pick that career for her? JB: Karena was originally an on-air meteorologist—a weathergirl, and I tailed Pete Bouchard at Boston’s WHDH and Belinda Jensen at the Twin Cities’ KARE-11 news to get the details of her profession (they were so kind to let me crash into their studios). I loved being able to show readers what this was like, but I realized that Karena knew more about weather than the reader did, so much of the novel became “reader-feeder,” trying to find ways to wedge her knowledge in without being obtrusive. In the end, I couldn’t do it, so I gave Karena a profession that enabled her to ask a lot of questions about chasing—what most readers wouldn’t know but would want to know. Like: Why do people DO this? I’m lucky to have many friends who are reporters at the Globe, and they generously read and vetted Karena’s experience. AS: What were your greatest challenges in writing The Stormchasers? JB: The toughest thing was that because of the miraculous success of my first novel, THOSE WHO SAVE US, the ‘CHASERS was sold before it was written, when it was very much in the architectural stages. I had never written fiction on a deadline before, and it paralyzed me. For days and days I would get up, do my email, trawl Facebook, go shopping, walk the dog, then think, too late, I’ll try again tomorrow. I fantasized about running away from Boston, with all its distractions, and going somewhere really isolated to write; I went so far as to pack the car and sat in it the afternoons with the dog, eating road snacks and then going back inside for a nap. Finally my agent, who is French and fierce and doesn’t miss a trick, called me and demanded that I write her a scene by the end of the day. “Now?” I said. “But it’s naptime.” “Go,” she said, so I did. She continued to demand a scene a day, and she gave me permission to run away from home to do it. So I went to live in a motel in rural Minnesota, where the ‘CHASERS is set, with my dog, Woodrow. And we stayed there until the novel was done. AS: When you write do you use your own experiences or completely separate yourself? JB: A little bit of both. I don’t know any fiction writer who makes everything up completely. If they do, I envy their imagination. Then again, I am incapable of telling anything truthfully—even stories in my own life get a little embellished, according to my reporter friends. What happens is I take an emotional situation that fascinates me—usually having to do with people’s lives being wrenched out of socket by huge forces beyond their control. And then I plug it into a fictional situation. Any truths I start with, including characters “inspired by” actual people, as they say on TV—they become totally alchemized into fiction through this process. AS: How do you manage to remove yourself and your opinions from a story? Do you/ is it possible? JB: It is extremely important to me not to proselytize to the reader, to give my opinion or take a moral stance. To me, that’s not what fiction is for, and if I read fiction that seems preachy or obvious, it’s not doing its job. And particularly given the subject matter I work with—the Holocaust, mental instability—it’s actually a moral imperative for me to steer very clear of providing easy answers or platforms. In fact, quite the opposite: I give main characters opposing points of view and let the reader bring his or her own opinion to the table. It’s a Hegelian principle that drama consists not of right and wrong but two equally powerful points of view, both of which are right. AS: What is the most difficult emotion to write? JB: Fear, is my first response—but any emotion can be challenging to write because you don’t want it to be heavy-handed. There’s the struggle between wanting to personalize the emotion by making it physical—a character’s stomach knots when she’s frightened, for instance. Show, don’t tell. But a little of that goes a long way and can seem clumsy and disingenuous, too. I mean, you don’t want a character habitually sobbing, barfing, or getting an eye-twitch every time something exciting happens, for instance. I finally decided after trying to calibrate this delicate balance that the best way to do it, for me, was to be honest and direct about what the character is feeling. “Karena looks up at the black boiling sky. She is terrified.” And unless a specific physical symptom that’s organic to that character suggests itself, that’s it. AS: Why do you write? JB: I’ve always wanted to be a writer, ever since I can remember. I’ve never been good at anything but writing, talking about writing, teaching writing, and food service. This doesn’t really answer your question, though. Really, I write because I have to. I have people in my head and they have stories that need to be told, and if I don’t get them down, it makes me feel a little crazy. AS: You teach a novel writing workshop at Grub Street? How does teaching impact your writing? JB: I absolutely adore Grub Street, and it’s the reason I stay in Boston. I’ve lived in different cities and they’ve had their charms, but they didn’t have Grub—this friendly, dynamic, serious life-support system for such talented writers. I’m taking a break from my “Council”—my ongoing, 5-year master novel class—right now to promote THE STORMCHASERS, but I miss it powerfully, because one thing being among my Grub novelists allows me to do is talk writing. What’s working, what could be improved, why. The creative process, its magic and its balkiness. Talking about pure writing is an oasis for me amidst the business of writing, which is also amazing but a horse of a completely different color. AS: What characteristics do you like best about Karena? JB: Oh, goodness. It’s like asking, what do you like about your child? I love Karena—all my characters in this book! Well, I like how smart Karena is, and her sense of humor, and her persistence—although she’s scared a lot of the time, and who wouldn’t be given the things that have happened to her, she doesn’t give up. In fact, I think the trait I like best in Karena is her courage. She might not describe herself as courageous, but then again many courageous people don’t, because they feel fear. Karena has been through a lot of trauma and it has made her wary, yet she is willing to keep extending herself to other people—especially if it means finding and helping her twin brother, Charles. To be afraid and act anyway is the definition of courage. AS: When do you know that you’ve developed a character enough and when do you know when a story has been completely told? JB: I don’t really think in terms of developing my characters enough because to me, they’re real people, and as with real people, there’s always more you don’t know. Even the people I know best in my life have their mysteries—even the person you think you know best, yourself, can surprise you! I look at my characters through this window of time I’ve been given, the parameters of the story, and I get to know them as best I can for that duration. I probably know them better than anybody, but I like to give them the dignity of their own lives. As for the story, I’m an adamant structuralist, so before I set out to write anything—story, novel, scene—I’ve already charted where it’s going and why. That’s what “plot” means, in the strictest sense: “To chart out in points” (Webster’s). So I know when the story should end. As to when a book is done, slightly different question, I think when you’re dickering between word choices—“Gaze or stare? Gaze or stare? GAZE or STARE, damn it?”—you’re ready to release it into the world. As I am about to do with THE STORMCHASERS. I hope everyone enjoys it! This entry was posted on May 28, 2010, 18:20 and is filed under Books, Interview. You can follow any responses to this entry through RSS 2.0. Both comments and pings are currently closed.